Department of Anatomy 1, Tagore Medical / Dental College, Chennai - 600127, Tamil Nadu, India. Department of Anatomy 2, Princess Noura Bint Abdulrahman University, Saudi Arabia. ABSTRACT: Neurodegeneration is a powerful initiator for a number of nervous system related diseases that come under the term “neurodegenerative diseases”. Neurodegenerative diseases are incurable, results in the progressive degeneration of nerve cells and causes problems with movement and mental functioning that became a challenge in present day’s health care. For this study we made a model of Huntington’s chorea, one of the neurodegenerative disorders by inducing experimental neurodegeneration and tried to prevent the neurodegeneration by giving ethanolic extract of Withania somnifera and its active principle withanolide A 10 days before the lesion surgery. The herb Withania somnifera is a well known herb in India and was used by all the Ayurvedic legends for nervous system related problems. We used 5 animal groups for this study they are CO, SC, LC, WS125 and WA100. All the animals were trained to walk in a narrow beam prior to surgery and were analyzed for motor co-ordination on the 5th day post lesion to find out the protective nature of the drugs employed. The results were amazing. The behaviour of the drug group animals were more equivalent with the control animals unlike the LC animals, performed with lots of errors on beam walking. These results clearly indicates that the drugs were very good in protecting the nerve cells from experimental degeneration and so can do the same action in real life. INTRODUCTION: Neurons are the building blocks of the nervous system and normally they don’t reproduce or replace themselves, so when they become damaged or die they cannot be replaced by the body. Huntington's disease (HD) is a neurodegenerative disorder that leads to progressive cell death mainly in the striatum, the main part of basal ganglia. Neychev et al., 2008 1 suggested that expression of dystonic movements depends on influences from basal ganglia by inducing lesions in striatum. As basal ganglia is considered as “extrapyramidal” motor system the disorders of basal ganglia are called extrapyramidal disorders 2, accompanied with decline in cognitive, motor, and psychiatric functions. At present there is no cure for HD, and full-time care is required in later stages of the disease 3. As the disease advances, uncoordinated, jerky body movements become more apparent, along with a decline in mental abilities. Even the patient is incapable to apply steady pressure during handshake, a characteristic of Huntington’s disease called milkmaid’s grip 4. The neuronal degeneration and other complications such as pneumonia, heart disease, and physical injuries reduce the life expectancy and cause death within 10 to 20 years from the onset of disease 5. Withania somnifera (authentication number-PARC/2008/204) also known as Ashwagandha is an important herb in ayurvedic and indigenous medical systems. The leaves, berries and tubers of Ashwagandha were used for centuries in India as a home remedy and the extract is an important part of Indian Ayurvedic medicine. The active principles of Withania somnifera, the withanolide A and Withaferin A were well known for their regenerative properties 6 and anti-fibrotic activities respectively. The study of Dhalla et al., 7 also confirms the ability of Withania somnifera in regeneration of axons, dentrites and synopses. Prakash 2013 8 evaluated the neuroprotective effect of Withania somnifera (Ws) root extract on Parkinsonian mice and proved its protective role against MB-PQ induced nigrostriatal dopaminergic neurodegeneration. As neurodegeneration is the root cause for a hand full of neurological disorders that affects the health, socioeconomic status and mental well being of millions of people worldwide without any cure we decided to apply some herb to play the role of neuroprotection as a regular fashion. As the herb Ashwagantha was in talk with neuroprotection and nerve cell regeneration we decided to employ the extract of Ashwagantha and its active principle withanolide A in neuro-protection of striatum in a rat model of Huntington’s chorea. Micromotor hand drill – to make a purr hole in the rat skull. Hamilton syringe - to inject kainic acid into the striatum in micro volumes. Narrow beam - apparatus for analyzing balance and motor co-ordination of animals. Ethanolic Extract of Withania Somnifera: The ethanolic extract of Withania Somnifera was prepared by soxhletion method following Elayaraja et al.,9 and the IP dosage of this drug was prepared by dissolving the ethanolic extract of the drug in normal saline, the volume was adjusted to 1ml for each animal. Animals: Adult male Sprague Dawly rats (200 -250 gm) were housed under standard laboratory conditions and maintained in compliance with strict institutional guidelines. The room environment was maintained at 20 ºC ± 2 ºC; alternating 12 h light - dark cycle with food and water ad libitum. The total experimental design was approved by the institutional animal ethical committee (IAEC/XIII /11/CLBMCP/2008-2009). 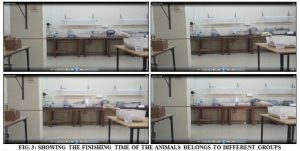 Maximum effort was taken to minimize the unwanted stress to the animals and to reduce the number of animal to be used for this study. For this study the animals were divided into 5 groups with 6 animals each Table 1. Group 1 - the control animals. Group 2 - sham control animals. Group 3 - lesion control animals. Group 4 - WS 125 mg drug treated animals with lesion. Group 5 - WD100 µg drug treated animals with lesion. The drug group animals were given the specific volume of drug for 10 days prior to lesion surgery, on the day of surgery and till the end of the study. The animals were also trained to walk on the narrow beam without any slip before surgery. A lesion surgery was performed with the aid of stereotaxic frame by injecting 0.5µl of kainic acid into the striatum of animals bilaterally. All the animals were assessed for their motor co-ordination by beam walking. The study was conducted on 5th day post lesion. Beam Walking for Motor Coordination: 10 Beam walking is a parameter for analyzing the balance and motor coordination of animals so as to analyze the integrity of the nervous system. This was done with a help of an apparatus called narrow beam apparatus. Apparatus: Fig. 1 it is a plywood made beam with 150 cm length × 2.5 cm width that placed 50 cm above the ground level. One end was mounted on a narrow support and the other end attached to the home cage into which the mouse could escape. Two angle poise lights (60 W) were positioned above and to one side of the start of the beam. Trial: Rats were given 4 trials per day for 5 days for a time of 60 sec prior to lesion surgery. Test: This was done on the 5th day post lesion. Rats were acclimated in the testing room for 15 min. They were kept in the starting position on the narrow beam and allowed to run, cross and escape into the home cage. Parameters: Time taken to finish the beam walking Fig. 2, 3. Number of times the limb of the rat slipped off from the beam Fig. 4. RESULTS: The ability of the rats to traverse the narrow beams to reach an enclosed safety platform without any foot slips was used to access the motor coordination and balance of rats. Two parameters were selected in this study. The results obtained from the parameters were tabulated and bar diagrams were drawn for analysis. Finishing Time in Narrow Beam: Fig. 5 Finishing time in beam walking according to the procedure is 60 sec but all the animals finished beam walking well before the said time including LC animals. So the results were drawn based on the comparative finishing time between the groups. The LC group animals took significantly more time to finish the narrow beam in comparison with the CO animals. The SC and WS125 animals finished the narrow beam equal with the CO animals. But the WD100 animals finished the task significantly faster than the other group of animals including the CO animals. Number of Slips in Narrow Beam: Fig. 6 The LC group animals shown maximum number of slips as the animals lost their CO- with CO animals. Ordination and balance due to degeneration of nerve cells in striatum. So their performance was significantly low when compared. The animals SC and WD100 finished the beam without any slips. The animals WS125 too shown a few slips, but in comparison with LC group those errors were negligible. DISCUSSION: Prakash 2013 11 evaluated the neuroprotective effect of Withania somnifera (Ws) root extract on parkinsonian mice against nigrostriatal dopaminergic neurodegeneration. Grover 2012 12 quoted that withanolide A can be used both in treatment and prevention of Alzheimer’s disease and associated pathology. Qaid et al., studied hypobaric hypoxia-induced memory deficit in rats13 and Soman 2012 14 investigated the effect of Withania somnifera (WS) root extract and withanolide A (WD) in restoring spatial memory deficit by oxidative stress induced alteration in the hippocampus of epileptic rats and suggested treatment with WS and WA has ameliorated spatial memory deficits by enhancing antioxidant system and restoring altered N-methyl-D-aspartate receptor density. In this present study we analyzed the neuroprotective role of ethanolic extract of Withania somnifera and withanolide A in preventing the neurodegeneration of striatum by analyzing the motor co-ordination and balance of the animals in narrow beam as the striatum is a part of the extrapyramidal motor system. Two parameters were selected in beam walking. 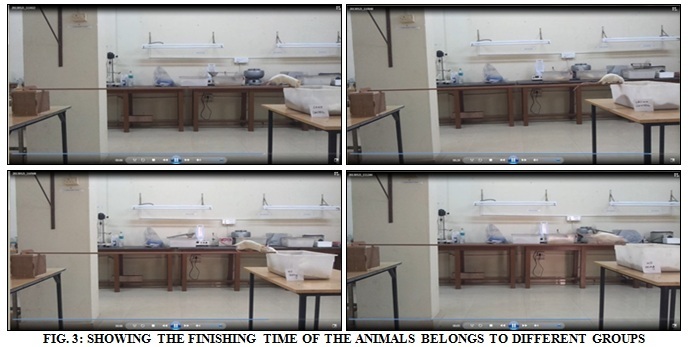 They were the finishing time and the number of slips that the animals made during test after lesion. The CO animals performed normally on the day of test. The LC animals had the maximum number of slips and are the slowest finisher of the narrow beam among others. The WD100 animals finished narrow beam faster and without any slips. The WS125 animals also finished the narrow beam faster with a few slips on the beam. Based on this study we can say that the drug WD100 was more effective in neuro-protection, the drug WS125 also was equally effective in neuroprotection but stands next to WD100. This clearly states that pretreatment of WD100 was very much effective in protecting the striatum in Huntington’s chorea and the drug WS125 also was equally effective. So both the drugs can be developed further against neurodegenerative disorders like Huntington’s chorea or Alzheimer’s either as treatment or very much as neuroprotector. CONCLUSION: Only a small proportion, less than 5% of neurodegenerative diseases are caused by genetic mutations and the remaining are caused either by the buildup of toxic proteins in the brain or creation of neurotoxins by malfunctioned mitochondria. These neurotoxins involve in the production of free radicals and they are responsible for the progressive neurodegeneration in most of the neurodegenerative disorders. Both the drugs employed in this study are well known for their antioxidant property 15 and the role was proved by this study in neuroprotection by analyzing the behavior of animals in beam walking. As the herbs are more protective without any side effects we can very well develop both the drugs as neuroprotector against any neurodegenerative disorder. ACKNOWLEDGEMENT: We are very much thankful to Dr. Venkatraman, former director of CLBAID Mehta college of Pharmacy for his valuable guidance on the course of the study. We are also thankful to the technical staffs belongs to the Department of Anatomy, Tagore Medical College for their kind help. Neychev VK, Fan X, Mitev VI, Hess JE, and Jinnah HA: The basal ganglia and cerebellum interact in the expression of dystonic movement. Brain 2008; 131(9): 2499-2509. Oczkowska A, Kozubski W, Lianeri M and Dorszewska J: Genetic variants in diseases of the extrapyramidal system. Current genomics 2014; 15(1): 18-27. Payne J: Huntington's Disease. Brain / Nerves / Neurology 2016. Tasman A, Kay J, Jeffrey A. Lieberman, First MB and Riba M: Psychiatry, Edition 4 2015; 1: 1701. De Maagd G and Philip A: Parkinson’s disease and its management, Part 1: disease entity, risk factors, pathophysiology, clinical presentation, and diagnosis. Pharmacy and Therapeutics 2015; 40(8): 504-510. Dhalla NS, Gupta KC, Sastry NS, and Malhotra CL: "Comparative studies of Withania somnifera Dunal and Withania shwagandha Kaul". Indian Journal of Pharmacy 1961; 23(5): 126-127. Prakash J, Yadav SK, Chouhan S and Singh SP: Neuroprotective role of Withania somnifera root extract in maneb-paraquat induced mouse model of parkinsonism. Neurochemical Research 2013. Elayaraja A, Vijayalakshmi M and Devalarao G: In-vitro free radical scavenging activity of various root and rhizome extracts of Acorus calamus International journal of pharma and bio sciences 2010; 1(4): 301. Carter RJ, Lione LA, Humby T, Mangiarini L, Mahal A, Bates GP, Dunnett SB and Morton AJ: Characterization of progressive motor deficits in mice transgenic for the human huntington’s disease mutation. The Journal of Neuroscience 1999; 19(8): 3248-3257. Grover A, Shandilya A, Agrawal V, Bisaria VS and Sundar D: Computational evidence to inhibition of human acetyl cholinesterase by withanolide a for Alzheimer treatment. Journal of Biomolecular Structure Dynamics 2012; 29(4): 651-62. Qaid EYA, Zakaria R and Sulaiman SF: Insight into potential mechanisms of hypobaric hypoxia–induced learning and memory deficit – Lessons from rat studies. Human & Experimental Toxicology 2017; 36(12): 1315-1325. Soman S, Anju TR, Jayanarayanan S, Antony S and Paulose CS: Impaired motor learning attributed to altered AMPA receptor function in the cerebellum of rats with temporal lobe epilepsy: ameliorating effects of Withania somnifera and withanolide A. Epilepsy Behaviour 2013; 27(3): 484-91. Senthil K, Thirugnanasambantham P, Oh TJ, Kim SH and Choi HK: Free radical scavenging activity and comparative metabolic profiling of in-vitro cultured and field grown Withania somnifera Public Library of Science one 2015; 10(4): 0123360. Praba MA, Venkataramaniah C and Kavitha G: Neuroprotection of ethanolic extract of Withania somnifera and withanolide a in motor co-ordination on experimental huntington’s rat model. Int J Pharm Sci & Res 2018; 9(11): 4800-04. doi: 10.13040/IJPSR.0975-8232.9(11).4800-04.